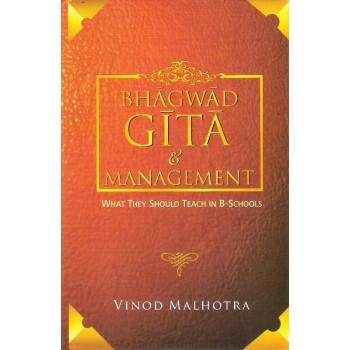 The Srimad Bhagwad Gita, the song divine is a complete treatise on management. Contrary to the general perception, the Gita is not a religious document. It is a veritable storehouse of profound practical knowledge in the spiritual space. The primary focus here is on managing the self, the external environment, interpersonal-relationship, how to live one's life and do business on sound ethical principles in the socio-economic context. It helps you to find your goal in life and guides you to pursue it with a mission. About the Author: Vinod Malhotra : Born in Simla on 20th July, 1949, Vinod Malhotra has his education in Simla, Chandigarh and Delhi. He joined the Indian Administrative Services and spent 38 years in different areas of public service. He found time to pursue his interests in Indian classical music and Vedanta philosophy. Both science and spirituality held great fascination for him and he looked at the possible areas of convergence between the two. His diligent search and in-depth study of the Bhagwadgita, the song divine, revealed several truths and myths mankind has to grapple with.